High costs for basics, from gasoline to clothing, make eating well on today’s stretched incomes a challenge. But with attention to how you shop, and by preparing more meals from scratch at home, it’s still possible to enjoy a healthy diet and maintain a healthy bank balance. You may find you’re eating better than ever! Map out a week’s worth of meals, figuring in leftovers, pantry items, and school or work lunches. Consider preparing an additional casserole or soup to freeze. Alternate between easy dishes and time-consuming recipes so kitchen prep isn’t overwhelming. Use the Food Pyramid as a guide for choosing foods to eat and for planning meals, concentrating on whole grains, vegetables, fruits, and low-fat or fat-free calcium-rich dairy products. Go lean on protein: eat more fish, beans, peas, and nuts and seeds. Eat only good oils and fats, like olive oil, and keep them to a minimum. Practice portion control.Be aware of how much meat you’re eating: a 4-ounce daily serving of lean meat provides enough protein for most adults. Canned salmon, tuna, and chicken are all terrific protein alternatives to pair with salads or grains, plus another way to control portion sizes. Discover some delicious veggie dishes. Add one or two meat-free meals each week featuring good-for-you whole grains and inexpensive dried or canned beans and lentils. Stay focused on your favorites. Use coupons if they offer lower prices on items you already buy regularly. Shop the perimeter first to get essential meat, produce, and dairy products. Inner store aisles typically stock nonessentials such as soda, chips, cookies, baking products, cleaning items, and so forth. Read unit prices for food products to compare food costs ounce for ounce between brands. Select generic products for price savings, and check higher and lower shelves for lower-priced items; the most expensive products are typically stocked at eye level. Find fresh fruits, such as apples and oranges, and vegetables such as onions and potatoes by the bag, not by the piece, to get the cheapest prices. Always buy produce in season when it’s most abundant and cheapest, and compare prices of fresh vs. frozen, both of which are more nutritious than canned. Choose 90% lean ground beef instead of 95% lean, and simply drain the fat well after cooking. Buy bone-in chicken pieces and sometimes save a dollar or more per pound. Roast half a turkey breast to use atop salads or to make sandwiches instead of buying sliced deli meat. Use the bones for soup. 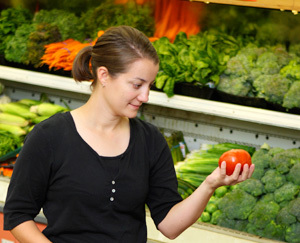 Buy lettuce, cabbage, and carrots loose; the bagged, prewashed versions cost more. Look for day-old breads, which are still fresh and just as nutritious as just-delivered items, and check the store’s reduced rack for other specials. Mix up your high- and low-cost options. For example, whole-wheat pasta typically costs more than regular (white) pasta, so eat well and save money by mixing the two together. Look for in-store two-for-one deals on milk, and shred or grate your own block cheese to save money. Rather than thinking in terms of limitations and restrictions, consider your budget and your healthy eating goals as framework within which you can redefine your old eating habits. It's a time to explore overlooked options, try daring ingredient substitutions, and look for creative food combinations that satisfy comfort cravings and support a healthy body and bank account. Judith H. Dern lives and cooks in Seattle where she makes a mean version of inexpensive pad thai.